At Sweet Peppers Deli, we strive to provide our customers with the most delicious food made with the freshest ingredients. We guarantee our food and service will be satisfactory with every visit. Check out our full menu below to see our vast selection of amazing items. Cajun shrimp, white BBQ sauce, cheddar and Monterey Jack, fresh pico, green onions — all with our own bayou spice. Pepperoni, ham, bacon, salami, and mozzarella with tomato basil sauce. 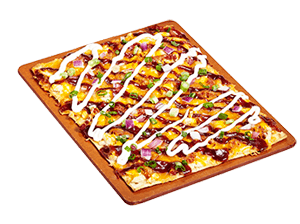 Tender chicken, sweet and tangyBBQ sauce, cheddar and MontereyJack, sun-dried tomato, red onion, and sour cream. Half-size portions of our menu items. All sandwiches are served on a signature French loaf. Served on Fridays and Saturdays. Served on Tuesdays and Wednesdays. Served on Mondays and Tuesdays. Served on Wednesday, Thursday, Saturday, and Sunday. Served on Sundays and Mondays. Served on Thursdays and Fridays. Chocolate fudge and cheesecake topped with caramel and pecans on a graham cracker crust. New York-style cheesecake swirled with puréed fresh strawberries and a hint of lime juice on a graham cracker crust. A pyramid of rich chocolate cream covered with nuts, chocolate chips, and turtle cheesecake, with chocolate curls and caramel erupting from the center. Smooth cream cheese icing sandwiched between layers of moist carrot cake and topped with pecans and fresh shredded coconut. Cream cheese, pure vanilla, and butter baked on a pecan & graham cracker crust. Tortilla chips, chicken breast, Rotel cheese, white and traditional BBQ sauces, sliced pepperoncini, and green onions. Tortilla chips topped with Rotel® cheese sauce, Cajun shrimp, fresh pico, chipotle ranch, and green onions, and jalapeños. Tortilla chips topped with homemade chili, cheddar & Monterey Jack, tomatoes, green onions, black olives, sour cream, and sliced jalapeños. A bowl of Rotel® cheese sauce, served with tortilla chips and a side of jalapeños. Hummus, cucumbers, tomatoes, and Kalamata olives, served with warm pita bread. Ham or turkey and cheddar on toasted wheat served with sliced apples. A junior size Peppers’ Chips & Rotel®. A small baked potato with cheddar & Monterey Jack. Mozzarella and tomato sauce on pita. All beef hot dog, served with sliced apples. A cheese-filled, grilled tortilla served with sliced apples. Elbow pasta and the Cheesiest™ cheese.